A highway patrol officer stood on the sidewalk, giving us a knowing look. Neither Bighorn or I expected his response when we asked about the legality of hitchhiking in Burney and admittedly I was a little skeptical. “Well it’s a public service, isn’t it?” He smiles, laughing a little at our trepidation. Within minutes, the trunk was open, our packs loaded, and for the second time this trip I sat in the back of a California Highway Patrol car, being driven to the PCT trailhead. Although this particular officer deemed his kindness one of public service, his willingness to drive well out of his way to get us back to the trail seemed above the call of duty. When it comes to kindness from strangers, we see things like this all the time. I’m always in awe of how far others are willing to go to help hikers. Let’s be honest, we smell bad, we’re usually too tired to have meaningful conversations, and we make everything we touch very, very dirty. However, without fail, every town has been full of incredible and compassionate individuals looking to lend a hand. With almost two and a half months of trail life under our belts, all of the kindness we’ve experienced has served as wonderful lessons into the world of helping others. If we gain nothing else from this adventure, I’m grateful to have at least learned the following lessons. I’ve said this before, but when it comes to asking for help I am absolutely terrible at it. Even when I know fully well what I want or need, I’ll usually beat around the bush fearing the harsh cruel hand of rejection. Typically, the fear is unwarranted because when I finally grow the cojones to simply ask, people almost always say yes. Out on trail, this has been especially true. Trail angels, curious towns people, other hikers and nearby friends are always looking to provide a helping hand. And most of the time, all it takes is an ask. While in Tehachapi, we were overwhelmed by the generosity of trail angels. So many people stopped us in town, asking if we needed a ride anywhere or offering help. By the time we were leaving, we didn’t want to burden another trail angel so we figured we would try to get a hitch out of town. After a while of trying to hitch, two friends, Shitsplints and Amanda, walked by and offered us the number of a trail angel. He gives rides to and from the trailhead all season, and Amanda said he was very willing to help. We decided we would give him a call. On that day, Dogbite (the trail angel), had given 30 hikers a ride to the trailhead. We were number 31 and 32. He spends the height of the hiker season on break from work, driving hikers around and helping in whatever way he can. His excitement towards trail angeling was contagious and we were glad we had decided to call him and take the opportunity to meet such a compassionate man. And all it took was a simple phone call and request. I think before the trail, I might have been skeptical about giving a hitchhiker a ride or the thought of asking someone, unsolicitedly, if they needed help wouldn’t have always crossed my mind. Since beginning the trail though, I’ve been helped by so many people in such a multitude of ways. Each example of kindness has affirmed a positive lesson for me: we should always seek to help others whenever possible. My favorite example of this came from an experience of trail magic in the Mojave. Bighorn and I weren’t looking forward to the long stretch of hiking between Tehachapi and Lake Isabella, known for being particularly dry and exposed to the sun. However, between two days, we came across three stretches of trail magic that completely transformed our experience. On one of the stops, along Kelso Valley Rd, we met two of our favorite trail angels yet. Margy and Bill drive through the area often throughout the year as they head up to Mammoth Lakes, and they are avid hikers themselves having completed the JMT. They had done trail magic another year and had so much fun connecting with hikers that they decided to do it again this year. The thing that stood out to me the most about Margy and Bill were how strongly they held onto their connections with others. 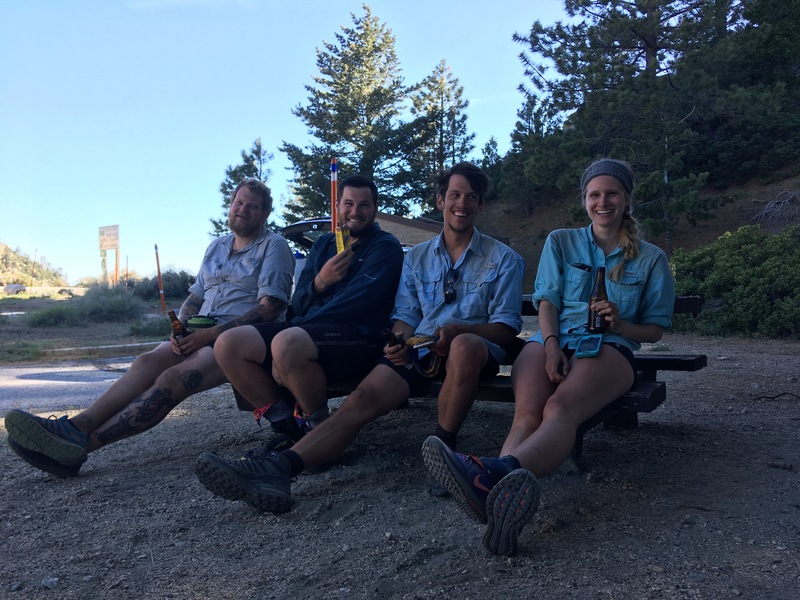 After meeting hikers for sometimes only brief moments along the trail, they kept up with their adventures through each hiker’s blog or exchanged contact information. Their interest in staying engaged and connected with others was so genuine, and even just from a short stop at their trail magic you could tell these two cared deeply about those they met along the trail. Their generosity was also outstanding. Over the short period of time we got to know them, Margy and Bill offered to have us over in Mammoth Lakes if the timing was right. They knew all the hiker needs, of course, laughing that they did indeed have a shower and laundry (a hiker’s favorite). This gesture has stuck with me a lot over the past few weeks. I’ve noticed that trail angels are often so trusting of hikers and willing to go to great lengths to help them. What might seem like a simple offer to one person, a ride down the road or a place to take a shower, can have such a huge impact on another. Another example of incredible kindness, hikers enjoy the Casa de Luna experience outside of Agua Dulce. As constant travelers at the moment, it’s gestures like these that have made our trip more enjoyable. 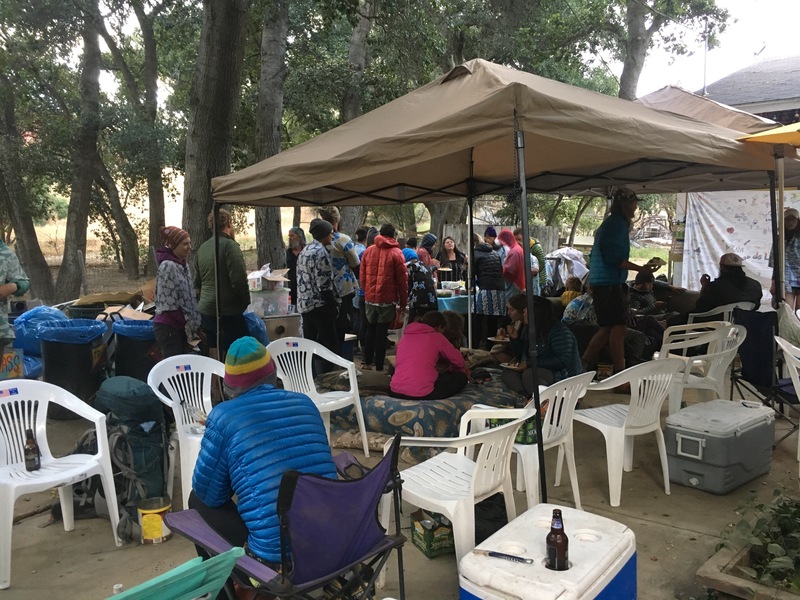 Instead of spending our off days searching for lodging or trying to figure out how to get into town, trail angels have been readily by looking for ways to help. It’s left a strong impression as to the importance of being willing to lend a hand, and we’re grateful to have a changed mentality when it comes to putting ourselves out there to help another. It’s my hope that, in the future that is post trail life, we can pay it all forward by being a support system to others day to day. People can often get carried away in deciphering what specific ways they can lend a hand. For example, I recently heard of a friend who met a man at a trailhead. They got to talking, and the guy lent our friend his car for the day to get around in town. I’ve heard of this happening a few times, and I’m sure for some this seems like way too much to offer a complete stranger. The thing is though, help doesn’t always need to be that extravagant. Help can be incredibly simple. We’ve had so many beautiful moments over the past two and a half months where a small gesture from another person has had a profound impact on our day. Just the other day, as I was crossing a popular road to reconnect with the trail, I was stopped by a day hiker named Gabriel. He asked me about my trip so far and we chatted for a few minutes, and then as I started to leave he offered me some fresh vegetables he had in his car. Or there was the time in Burney where Matthew walked up to us outside of the Safeway, offering us a Gatorade. In each of these instances, the offers were simple but they had a strong impact on our day. Fresh vegetables and cold drinks are hard to come by, and getting a ride four more miles down the road is the difference between standing in the hot sun a little longer or completing our resupply faster. From left to right: Sultry Bear, Buddha, Teva, and Grit enjoying some trail magic at the bottom of Baden Powell. Help can come in all shapes and sizes, and even the small, seemingly insignificant gestures can have a huge impact. Whether it be handing a bottle of water to someone standing in the sun or bringing a coffee to your coworker in the morning, small gestures are things we can all easily do without being put out too much. Lately I’ve been listening to a lot of podcasts that discuss ideas of intolerance towards others. It’s kind of a fear of mine that the world is slowly falling apart because of fear towards differences. We know that we’re more willing to trust those who are like us, which puts an unfortunate strain on building relationships and trust with those who are different. We see this all the time. Misconceptions about one another’s culture or religion breeds fear, aggression, and hostility. That continues to escalate over time and sometimes transform into violence and we’re left with a broken system of trust towards one another. I guess why this is so important to me is because I try to look at everyone the same way. Regardless of religious, racial, or cultural differences I want to believe that I can cooperate with everyone and build trust and lasting relationships. When it comes to the hiker world, this is something I notice everyday. There isn’t a lot of visual diversity on the trail, hikers are disproportionately white, but we all have different backgrounds and experiences that have helped us develop into who we are. Without a thought or concern towards those differences, I’ve seen examples daily of others reaching out of their way to help one another. From that experience, connections have grown and sometimes lasting relationships have formed. And, if nothing else, each of us have been able to learn that kindness and generosity knows no boundaries. I hope these are values that, over time, can replace our current system that is sometimes plagued by distrust or an unwillingness to reach out. It feels like our world could be such a kinder, safer place if we each thought more often of the ways in which we could lend a helping hand. We do need more kindness to each other. This is a really heartwarming, touching post! I enjoy your writing, Alexa, especially this one. If we could only see people on those “survival” terms most of the time, we would probably all have more compassion. Thanks for more inspiration, and let us know when you get close to us in Oregon. Bear sightings, snow, Trail Angels, and acts of kindness….Alexa I’m so proud of you hiking the PCT and will live vicariously throughout your adventure. I knew when you were in 6th grade that you would do good in the world, take risks, and have a full amazing life.